Snack Girl got herself a new salad spinner and I thought I would share the fun. Hey, a new kitchen gadget is something to brag about in my house. Maybe some of you buy bagged salad greens or just wash your salad in a colander. Have you tried a salad spinner? This takes the chore out of lettuce washing and will save you a lot of money over the long term if you are buying bags of salad. Why wash your lettuce? I hate to tell you this but there could be some nasty creatures on your lettuce such as E. Coli. You see they grow lettuce with fertilizer - and a major component of fertilizer is @#$% AKA feces. You don't need to scrub lettuce - but it is a good idea to rinse it well and then dry it before eating. 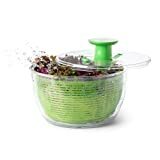 The salad spinner allows you to rinse and then dry your lettuce in one go. The spin part uses centrifugal force to get the water off the lettuce. Yes, it is fun to drop some physics terms onto Snack Girl every once in a while so you don't forget I am a super geek. 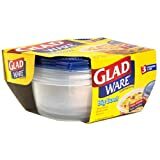 Then, you can store your lettuce in the spinner OR do what I do - and put the lettuce in individual large bowl containers from Glad or any other round container with a lid. These containers are BPA free and can be found at Target or your grocery store. They allow you to pack a large volume of lettuce for bringing to lunch. Do this once a week with a large head of lettuce and you have no excuses about eating salad. I have noticed the high price of buying a salad at lunch time ($7) and when the bacon cheeseburger is less expensive - it can be difficult to make the healthier choice. My advice is don't set yourself up for the choice in the first place because you KNOW you are going to order the burger. Romaine lettuce is my favorite because it stays fresher longer than some of the other softer lettuces. Due to its extremely low calorie content and high water volume, romaine lettuce is actually a very nutritious food. It as an excellent source of vitamin A (notably through its concentration of the pro-vitamin A carotenoid, beta-carotene), vitamin K, folate, and vitamin C.
That's right people, romaine lettuce isn't just water and fiber - you are getting some important nutrition from your salad. How do you make a salad part of every day? I have a smaller (white, not green) salad spinner of the same brand. I liked not having a huge thing to store, as I am the only salad eater here. I didn't realize you could wash and store the greens in advance. I thought they would go bad. How many days ahead can you prepare things like romaine lettuce and other greens? Pizza salad is brilliant! I LOVE pizza, but not all the fat & calories . . . this is a head-smacker - how have I not thought of this? A tactic I use for Chinese food (which we eat a lot of) is to order a big platter of steamed broccoli (there are lots of veggies to choose from, I just love broccoli the most) along w/all our other dishes - I mix that in with the other things or eat it on the side - bulks everything up, makes me feel full and cuts my calories, sodium & fat. My salad spinner was my most used kitchen item last week. Best thing I ever bought. I've been buying romaine and cutting it up myself, so much cheaper than bagged salad that gets slimy within days. My favorite is lean cuisine garlic chicken pizza that I pile Caesar salad on top of. Yum! I love my OXO salad spinner! Bought a less expensive one for salad spinner spin art! 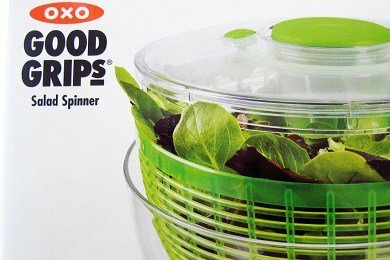 I LOVE my OXO Salad Spinner! It is about 10 yrs old and still works great! I make Super Salads every week (sometimes swap out cut up veggies and hummus/baba ganoush). For a Super Food Salad, I almost always have a rainbow of 5 ingredients on my shopping list: romaine, spinach, carrots, purple cabbage, tomatoes and/or red peppers. I re-purpose the large yogurt containers and divide the salad among 6-8 containers for the week. When I am headed out the door, I toss in a tomato from the window sill, and pour in a tablespoon of olive oil and balsamic. At lunch I shake the container to coat with dressing, and pour into a bowl at work. Yum! I like to add chick peas, avocado, and/or edamame. This makes menu planning a breeze, especially if I have a cup of soup or a bit of leftovers to go with my salad. I like the pizza-salad idea! I love the salad spinner! I'm actually giving three away on my blog. Great review and i love the idea of throwing cold pizza into a salad!! @A - this really depends on the freshness of your lettuce. I find that my romaine is good for 5 days before wilting keeping it in a cool part of my refrigerator. I hope this answer is helpful! I love cold lettuce and warm toppings! My favorites are recreating Taco Bell's taco salad or Applebee's Southwest salad. Taco Bell's is just refried beans, salsa, cheese, and rice, then for Applebee's I cut up some Chik'n nuggets, salsa, and mix avocado with Greek yogurt for the dressing. I will definitely have to try the pizza idea. I've been meaning to try putting salad on TOP of pizza crust, too! When I was growing up, my siblings and I would argue over who got the fun job of using the salad spinner to help my parents put dinner on the table. These new ones look like even more fun than the ancient one we owned! Sadly I am in a tropical country where Vegetables are near impossible without constant electricity. However, I concur that the romaine lettuce is by far the most durable -even in Nigeria. Glad makes it even easier to take a salad anywhere - Bowl for salad with built in container for dressing! You can get them at Wal-mart or Target - Target even has the same thing in their UP & UP brand a little cheaper. I wash my romaine and spinach every weekend for the upcoming week and leave it in my spinner in the frig along with a paper towel! That way it's washed and ready to go on my plate and all i have to do is add toppings. I find the paper towel helps it last even longer because it absorbs the moisture that will make it soggy and spoil! Matter of fact I put a paper towel in all my produce baggies when I arrive home from the store. It helps it all to stay fresh longer! I do hate that I feel like it's a little wasteful on the paper towels but where I live produce is not cheap and I do feel like it saves me money on the grocery bill! Honey, you aren't a nerd. There is no such thing as centrifugal force. Physics 101. Daniele, you must have crammed for physics 101 without understanding anything- and probably never went past 101. Centrifugal force does exist, but is considered a fictitious or pseudo force "exerted" by an object-- in this case, the lettuce- often in the context of an applied centripetal force. Don't be such a snark.